When the NASA’s New Horizons spacecraft buzzed by Pluto last year, it revealed tantalizing clues that the dwarf planet might have — or had at one time — a liquid ocean sloshing around under its icy crust. According to a new analysis such an ocean likely still exists today. The study, which used a thermal evolution model for Pluto updated with data from New Horizons, found that if Pluto’s ocean had frozen into oblivion millions or billions of years ago, it would have caused the entire planet to shrink. 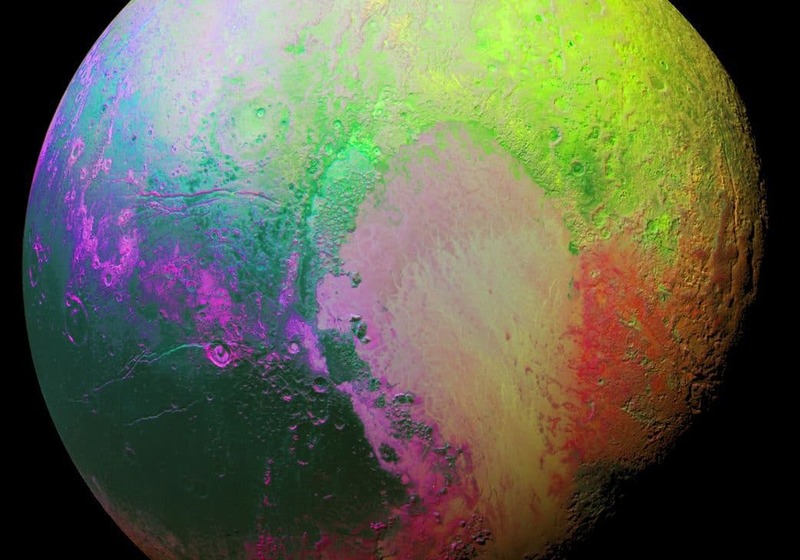 But there are no signs of a global contraction to be found on Pluto’s surface. On the contrary, New Horizons showed signs that Pluto has been expanding. “Thanks to the incredible data returned by New Horizons, we were able to observe tectonic features on Pluto’s surface, update our thermal evolution model with new data and infer that Pluto most likely has a subsurface ocean today,” said Noah Hammond, a Ph.d candidate in Brown University’s Department of Earth, Environmental and Planetary Sciences, and the study’s lead author. The research, which Hammond coauthored with advisors Amy Barr of the Planetary Science Institute in Arizona and Brown University geologist Marc Parmentier, is in press in Geophysical Research Letters. The pictures New Horizons sent back from its close encounter with the Kuiper Belt’s most famous denizen showed that Pluto was much more than a simple snowball in space. It has an exotic surface made from different types of ices — water, nitrogen and methane. It has mountains hundreds of meters high and a vast heart-shaped plain. It also has giant tectonic features — sinuous faults hundreds of kilometers long as deep as 4 kilometers shown in the NASA image below. It was those tectonic features that got scientists thinking that a subsurface ocean was a real possibility for Pluto. Scientists think that there may have been enough heat-producing radioactive elements within Pluto’s rocky core to melt part of the planet’s ice shell. Over time in the frigid Kuiper belt, that melted portion would eventually start to refreeze. Ice is less dense than water, so when it freezes, it expands. If Pluto had on ocean that was frozen or in the process of freezing, extensional tectonics on the surface would result, and that’s what New Horizons saw. 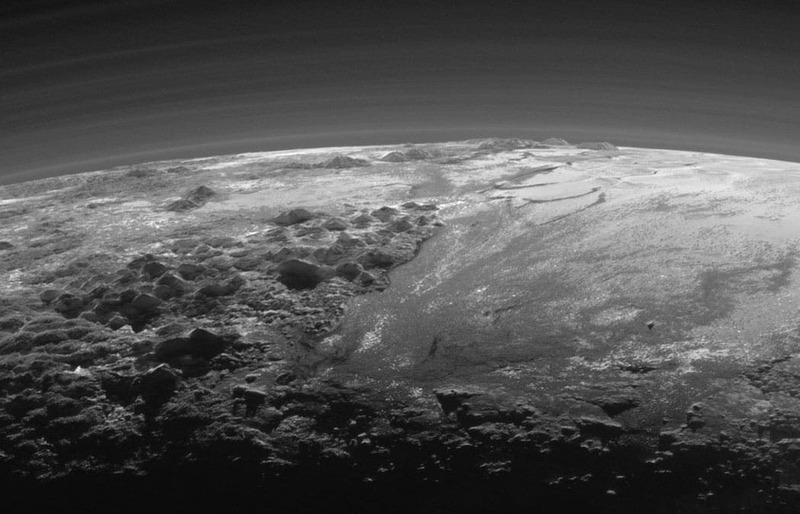 There aren’t many other ways on Pluto to get such features. One way might have been through a gravitational tug of war with its moon, Charon. But the active gravitational dynamics between the two have long since wound down, and some of the tectonics look fairly fresh (on a geologic timescale). So, many scientists believe that an ocean is the strongest scenario. But if Pluto had an ocean, what is its fate today? Could the freezing process still be going on, or did the ocean freeze solid a billion years ago? That’s where the thermal evolution model run by Hammond and his colleagues comes in. The model includes updated data from New Horizons on Pluto’s diameter and density, key parameters in understanding the dynamics in Pluto’s interior. The model showed that because of the low temperatures and high pressure within Pluto, an ocean that had completely frozen over would quickly convert from the normal ice we all know to a different phase called ice II. Ice II has a more compact crystalline structure than standard ice, so an ocean frozen to ice II would occupy a smaller volume and lead to a global contraction on Pluto, rather than an expansion. There are a few caveats, the researchers point out. The formation of ice II is dependent on the thickness of Pluto’s ice shell. Ice II only forms if the shell is 260 kilometers thick or more. If the shell is thinner than that, the ocean could have frozen without forming ice II. And if that were the case the ocean could have frozen completely without causing contraction. However, the researchers say there’s good reason to believe that the ice shell is more than 260 kilometers. Their updated model suggests that Pluto’s ice shell is actually closer to 300 or more kilometers thick. In addition, the nitrogen and methane ices that New Horizons found on the surface bolster the case for a thick ice shell. “Those exotic ices are actually good insulators,” Hammond said. “They may be helping Pluto from losing more of its heat to space.” Taken together, the new model bolsters the case for an ocean environment in the furthest reaches of the solar system. Image credit: Top of page, NASA/Johns Hopkins University Applied Physics Laboratory/Southwest Research Institute, of Pluto right as New Horizons flew by it.